Mr. Prince is pitching his idea as Mr. Trump’s new “Wollman Rink” moment, a reference to the president’s successful 1986 rehabilitation of a landmark Central Park ice-skating rink that was over-budget and years behind schedule. The proposal, seen by The Wall Street Journal, outlines ways for the U.S. to quickly replace most U.S. troops with contractors who would help carry out airstrikes and work side by side with Afghan forces across the country. Thus, the notion that Trump is stuck in the 1980s is not just confined to interpretations of Trump from the sideline; it's integral to how people around him play their cards. In 1986, the year that Trump "saved" Wollman Rink, one of the big pop hits was You Give Love a Bad Name, by Bon Jovi. Jon Bon Jovi has moved on. Trump hasn't. This photograph (via Saudi Press Agency) conveys an astounding message in the underlying event: a meeting yesterday in Jeddah of Saudi Crown Prince Mohammed bin Salman (MBS) with Iraqi cleric Moqtada al-Sadr. Moqtada is a major figure of Iraqi Shia politics, a key hate-figure for the American invasion forces, and an influential voice on the Iraqi street. That MBS would meet with him amid the constant feuding with Iran is a major statement that previous rules of engagement in the Gulf may no longer apply. Kevin Myers is 70. Donald Trump is 71. No, that's not a way to let Myers off the hook. But it is a way to point out that what Brexiteers like to portray as a North Atlantic Anglosphere has a public square afflicted with a cohort of people given platforms whose views have not evolved in 30 years. Myers doesn't realize that a 1980s blend of Jewish stereotyping and pro-Israel political views isn't viable in 2017. Donald Trump still talks about "inner cities" with the lens of the crack epidemic, and his obsession with TV breakfast chit-chat shows and who's on the Time magazine cover is a perfect reflection of that decade. The former has had regular access to newspaper columnist gigs. The latter is President of the United States -- put there by a voting bloc that likewise never moved on from the 1980s TV Trump. And then there's Brexit. That classic Fawlty Towers Don't Mention the War episode, except without the laughs. The era of Up Yours, Delors. The Irish border as something that the Irish government wasn't properly managing. They've never moved on, and the age profile of their Irish sympathizers is just as revealing -- a group also with access to newspaper columns. They're a combination of what was described by Yeats (ideas that began as a mound of refuse or the sweepings of a street, Old kettles, old bottles, and a broken can) and Keynes (slaves of some defunct economist, distilling their frenzies from some academic scribbler). Unfortunately, reducing their influence is a lot more difficult than sacking a newspaper columnist. More importantly, the Volks­wagen scandal has the potential to unhinge the German economic model. It has been over-reliant on the car industry, just as the car industry has been over-reliant on diesel technology. For its part, Berlin mollycoddles the industry and represents its interests abroad. The “VW law” in effect protects the company against a hostile takeover. And it was a former VW director, Peter Hartz, who wrote the labour reforms of the previous decade. In return, the industry contributes to the stability of regional employment. And the voting rules in the supervisory board ensure that production could be shifted out of Germany only with the explicit consent of the trade unions. In other words, it cannot. In terms of macroeconomic risk management, this is a silly strategy — similar to the UK’s over-reliance on the financial sector. Such strategies work well until they do not work at all. He was talking about the diesel emissions scandal, which at the time afflicted only VW. But as it widens in scope and is now augmented by an anti-trust scandal, the distortions arising from the favoured status of the car industry look even clearer. For the tyro reader, Fussell dispatches early the notion that class has much to do with how much money you have. Those who’ve paid any attention “perceive that taste, values, ideas, style and behavior are indispensable criteria of class, regardless of money or occupation.” Donald J. Trump is an instructive specimen in this regard. The biggest failure of American liberal political punditry over the last 18 months is the failure to engage with the class aspects of the Trump phenomenon. Trump's supporters are seen as closet racists, ridiculed for "economic anxiety," and/ or a benighted proletariat voting against interest. Yet the connection between these voters and Trump's inner circle love-hate relationship with Manhattan is precisely where class comes into play. Proof that the pundit class has still not reconciled with this issue is the mockery of David Brooks for an admittedly belabored example of class signifiers operating through restaurant menus -- yet his point was just exactly one that Fussell made above. The Telegraph's unsubtle graphic for a story relying on analysis of Brexiter Gerard Lyons that Philip Hammond's Brexit transition plan involves continued EU migration to the UK after Brexit. Of particular note: the arrows are one way, and they don't originate in the actual sources of large current EU migration to the UK. They do however originate in northern France, Benelux, and Germany. What possible historical echo could they have in mind? 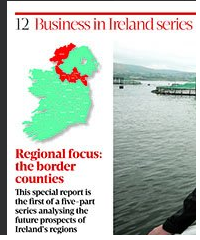 To the left is an illustration that the Irish Sunday Business Post -- a Brexit sneaking regarder publication -- has with a report on the areas of Ireland adjacent to the border with Northern Ireland. The West Brexit contingent has been quite busy over the last few days, inflamed by Michel Barnier's blunt assessment that Britain had presented no proposal on how to deal with the Irish border, leading to a revival of demands that this proves Ireland must leave the European Union. Anyway, the focus on the land border is understandable, but it's a trap. The main impact of Brexit on Ireland and Northern Ireland will not happen through the land border. Violence imposed a much harder border than customs posts ever did, and people found ways to function across the border even then. The main impacts will happen through the disruption to the UK's trade, investment, travel and migration links with Ireland that currently operate on the presumption that both are EU members -- and only a tiny fraction of those links involve physical crossing of the land border. So there will be scenic photography and warm Prosecco-worthy tales of borders passing through people's gardens as Dublin and London reporters head to Armagh and Donegal to cover the border issue. But the fixation on the border has as much to do with a perspective locked in, like Trump and 1980s television, in the era of the Troubles, on the border as a source of banditry and violence, as its current economic significance. And it lends itself to a view that razzle-dazzle technology, cameras etc, can "solve" the Brexit problem with Ireland, when it's actually a sideshow. It's that view that Ireland's government rightly lost patience with in the last few days; the border is an important issue, but it can best be solved by things that the Brexiters still do not want to acknowledge: the customs union, EEA, EFTA, or some other option that the UK government would need to start working on! No10: PM will begin a 3 week walking holiday on Monday - 5 days in Italy, 2 weeks in Swiss Alps (but no plans to think up another election). That means that Theresa May is spending 3 percent of the 2 year EU exit period -- a clock that she chose to start -- on holidays. And that's just this summer's holidays, and after all the time that was lost to the futile election. Meanwhile the newspapers -- even the "serious" broadsheets -- have already shifted to silly season mode of royals, celebrities, and sport. Brexit, like the Trump presidency, is a slow-motion in-progress disaster. Since just about any logic is possible in Trump world, it could be that his obsession with Abu Bakr al-Baghdadi is due to his mistaken belief that the elusive ISIS leader was Time Magazine's Person of the Year in 2015. He wasn't. He was the runner up, to Angela Merkel -- a lineup that must have driven Trump crazy. Trump's strange tweet this morning seems fixated on 2015, because that's when the New York Times story which he blames for the missed hit on Abu Bakr al-Baghdadi appeared. On 21 June, 2017, the day that the news broke that Prince Mohammed bin Nayef (MBN) had been removed as Crown Prince of Saudi Arabia in favour of his cousin Mohammed bin Salman, the Iranian media ridiculed the move as a "soft coup." The general reaction was to send congratulations to Riyadh. A flood of reporting today confirms that it was in fact a soft coup. MBN was detained until he agreed to the transition, he was accused of addiction to painkillers (a harsh accusation since the pain originated in a terrorist attack), and he remains confined to his palace without his own security. Sometimes, the Iranians are right! President Donald J. Trump spoke today with Crown Prince Mohamed bin Zayed Al Nahyan of the United Arab Emirates. First, and most importantly, the leaders agreed on the importance of implementing agreements reached in Riyadh to counter extremism and to combat the funding of terrorist groups. This was with reference to the Saudi Arabia and UAE led sanctions against Qatar. The Washington Post now reports that US intelligence agencies believe that the Qatar News Agency website hacking which precipitated the crisis was carried out by ... the UAE! And remember this is in the context where the supposed "last straw" -- the receipt of Qatari ransom money by Iran and Hezbollah -- may never have happened. Gibraltar will not be a victim of Brexit and has had guarantees from the British government it will not do a trade deal with the European Union which doesn't include the territory, its chief minister said on Sunday. That's an ambiguous statement which could mean that Gibraltar would be treated differently within such a deal. But it further highlights the self imposed constraints of the London Brexit strategy. Why should Ireland contort its border arrangements with Northern Ireland just so that Britain can hang on to what will be, post 2019, Falklands on Med? This detail -- that the money ended up with the Iraqi government -- has been occasionally reported over the last 6 weeks, but it's a critical detail, because the alleged payment of the ransom money to Iran and Hezbollah is also commonly cited as the "last straw" that led to the severe sanctions against Qatar. If anything, she values being left alone to concentrate on her writing. "For all my affability, I am also cold." You have to look after number one? "Well no, you have to look after what is right. In the case of work, you have to look after the work. If someone comes into your life that you don't want and keeps nagging you with emails and things, the gate comes down." She mimes a portcullis shutting in front of her face. This is Graham Greene's "splinter of ice": the chill at the heart of the serious novelist. Writers cannot be with you all that much. And even when they are with you, they are not really with you. Forget Shakespeare and Dickens, or even the Beatles and David Bowie. Today Britain’s most important cultural export to the United States is the use of tabloid tricks and reality TV techniques for influence and profit. Rob Goldstone may look like a bit player in this story, but he is an avatar of the new power brokers in the age of politics as entertainment. Welcome to your new ruling class. Made in Britain. It is this common factor that helps explain why despite concerns about "populism" as a global phenomenon, it has done the most damage in these two countries. But very tricksy of Australia to have successfully exported Patient Zero (Rupert Murdoch). The New York Times recounts the story of Moldovan soccer sensation and transfer market target Masal Bugduv -- a completely made up character created by Declan Varley and whose name is a loose phonetic spelling of a story by Pádraic Ó Conaire. Anyway, one thing the article never quite says is that the problem with these stories isn't on the social media fringes of transfer speculation: it is with player agents paying sports reporters in the conventional media to write these stories so as to get their under-contract clients into the transfer market. As with politics, social media is certainly part of the problem, but because of the way it magnifies distortions in conventional media practices. It's forgotten now, but in March 2017, the biggest "outrage" in Ireland was from the country's correspondent/ pundit class, enraged that former Taoiseach Enda Kenny had been too civil with Donald Trump. 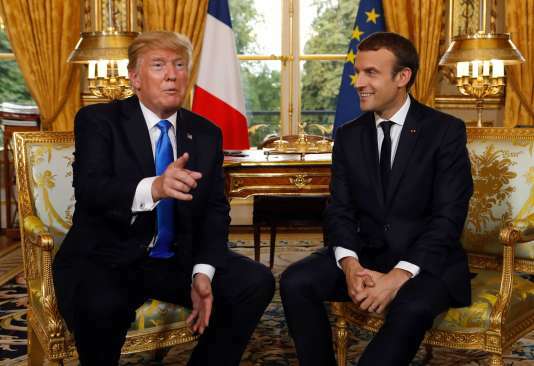 Photo: Trump with French President Emmanuel Macron during his invited visit to the Bastille Day celebrations. The UK has become so ludicrous because the issue of the EU is so deeply felt by a significant part of the body politic. The Brexiters are the Jacobins of UK politics. Their ideological intensity has devastated the Conservative party and reduced British politics to its present shambles. There is, as a result, neither a comfortable exit from Brexit nor a plausible way of managing it smoothly. Whom the gods wish to destroy they first make mad. So it now is over Brexit. You know, 30 years ago, our President wrote a book that holds words of wisdom for all future leaders that are gathered here today. It really is a book that’s inspired many leaders over more than three decades, and I believe it could be an inspiration to each one of you, as well. The book is entitled “The Art of the Deal,” and it’s actually an American classic. In that famous book, President Trump said, “I like thinking big,” because “if you’re going to be thinking anyway, you might as well think big.” And that’s exactly what our President has done throughout his life. He’s thought big. He’s achieved big, and today we have a President of the United States who’s literally lived the American Dream. It’s remarkable to think that our President, a grandson of an immigrant to this country, the son of a self-made businessman has lived the life that he’s lived and now finds himself in the Oval Office of the United States. It’s interesting -- I often tell people that our two family stories are somewhat similar. The President’s grandfather immigrated to this country, and my grandfather immigrated to this country from Ireland. His father was a self-made man who built a business with his own two hands. My dad built a small gasoline station business in a small town in southern Indiana. He, the man who calls himself “the Kid from Queens,” decided to build on that legacy, and he went to Manhattan Island to build the big buildings. In the Paris intelligence base -- RICKI TARR (dictating) Ricki Tarr claims to have further information vital to the safeguarding of the Circus. There's so much of the Trump-Russia entanglement that can be read as echoes of Tinker Tailor, the same level of amorality, but a much higher level of greed and incompetence, and of course much less style. The Leaders of the other (non-USA) G20 members state that the Paris Agreement is irreversible. We reiterate the importance of fulfilling the UNFCCC commitment by developed countries in providing means of implementation including financial resources to assist developing countries with respect to both mitigation and adaptation actions in line with Paris outcomes and note the OECD’s report “Investing in Climate, Investing in Growth”. We reaffirm our strong commitment to the Paris Agreement, moving swiftly towards its full implementation in accordance with the principle of common but differentiated responsibilities and respective capabilities, in the light of different national circumstances and, to this end, we agree to the G20 Hamburg Climate and Energy Action Plan for Growth as set out in the Annex. That means in particular that Saudi Arabia committed itself to the Paris Agreement, while the Trump administration didn't. Photo: via G20 Presidency website, head of Saudi Arabian delegation Ibrahim al-Assaf with Angela Merkel. Johnson said Britain's decision to leave the European Union would open fresh opportunities. "We'll still be there to stick up for our friends and partners in the Gulf ... But now for the first time since the 1970s we will additionally be able to do free trade deals and we'll be able to build on the extraordinary commercial relationships that already exist between the UK and the Gulf." BoJo is in Riyadh this weekend -- but not to seal a trade deal. Instead, he's part of a belated realization in western countries that the Qatar crisis is getting worse and needs urgent attention. One reason why the EU worked as an economic bloc is because the members had gone past the stage of being on the verge of war with each other. But Britain decided to leave that and look for trade deals with regions where that condition is not met. Finding a solution to how the UK-EU border in Ireland would work was a priority for the summer, Mr Davis (Brexit Minister) said, so it could be a "test border" for the rest of EU. The fact that the UK government views the Irish border as a potential model for the rest of the EU further highlights the ridiculous position of Ireland's West Brexiters, who insist that Ireland has to leave the EU to do a special deal on the border with the UK. Since Ireland is in the EU, the UK can't just focus on a bilateral deal with Ireland without thinking through the consequences for the rest of the EU. Hasn't Ireland historically done badly when Britain could deal however it likes with Ireland? Tell that to the West Brexiters. The poison is already running around the system. "We can work with half the Labour party and crush the f*ckers," says one Conservative MP, referring to his Eurosceptic colleagues. A leading pro-Brexit MP says he would not tolerate threats from the "wankers" on his party's pro-European wing. Remember that the West Brexit agitators in Ireland want to hitch the country to that dynamic. Emir of Kuwait Sheikh Sabah receives by hand the Qatari response to the demands from its other Gulf neighbours besides Oman. Kuwait is trying to act as an intermediary in the dispute. The Emir usually smiles in photos but he looks distinctly unexcited about his role in this case. Kuwait has unhappy memories of where such ultimatums end. It contains no original research, and the few numbers that are cited are cut-and-paste from media articles and press releases. It uses the Eurovision Song Contest as an analogy for Ireland's alleged loss of influence in the EU. It cites Denmark as an example of a country that controls the value of its currency, even though Denmark is in a tight peg with the Euro. It uses South Sudan as an example of a country that thought it was a good idea to launch its own currency. It refers at one point to the President of France as Francois Macron -- everyone from France is named Francois, right? It has a weird Sun-Delors style obsession with Michel Barnier, the EU Commission negotiator on Brexit, to the point where one wonders whether there was a past run-in between Barnier and Bassett. It ends by advocating that Ireland might need to leave the EU while retaining access to the Single Market, even though all of the UK-Ireland economic disruption it cites arise from the UK leaving the Single Market -- and thus all would remain with Ireland in the Single Market! It argues that Ireland is isolated in the EU because it has no overlapping memberships with other organizations unlike other EU members, and its list of such non-memberships includes the Commonwealth -- but the rest of the report is premised on Ireland's links with the UK. Its Anglo-pundit style familiarity with European politics shows in numerous places, including for example an assumption that Martin Schulz will be the next Chancellor of Germany. These problems -- and there are many others (see John O'Brennan) -- need to be on the table before this report is taken as evidence of a serious West Brexit position. The media designate what they are communicating about and must therefore distinguish it. For example, they inform people about scandals and in doing so must presuppose that non-scandalous behaviour would have been possible as well. What is not reflected here, however, is that one could pose the question (which a sociologist might pose) why something is even being observed in the schema scandalous/non-scandalous at all, and why the frequency of use of this schema is clearly increasing. In other words, the media remain (for good reason, as we shall presently see) invisible to themselves as an observer. They are turned towards the world in their operations and do not reflect that this turning itself generates an unmarked space in which they find themselves. Coverage of the Trump spectacle presents many challenges, but as we've said before, one of the challenges that he has posed to pundits, especially liberal pundits, is their lack of any engagement with sociological theories of the mass media. Here for example is a perfectly reasonable tweet from Farhad Manjoo that takes as given a particular role for the "mass media" even as the Trump spectacle strains conventional notions of "outrage" and "scandal" -- notions in which the media play a determining role. Sir W. Teeling (Brighton): Is my right hon. and learned Friend aware that the Home Secretary considers that the Malicious Damage Bill is likely to be a useful deterrent against "Mods" and "Rockers" going to seaside and other resorts, and is he aware also that the Home Office feels that the Bill cannot be got through much before the end of the Session unless it is brought in very soon? Can the Bill be brought in very quickly; otherwise, it is quite likely that we shall have more trouble in these resorts before it becomes an Act of Parliament? Prince Mohammed bin Naif: But, thanks to Allah, what I know is that nobody has a case of this kind against any member of your group. Suicide bomber: If you possibly can dispatch a special plane or anything so that I can speak to the youth from your office; for such a thing would certainly have them reassured. Prince Mohammed bin Naif: As you wish. You are the one who can evaluate the situation. If the situation remains the same until the plane is sent to you, you are then welcome. That's part of the phone conversation in late August 2009 between Prince Mohammed bin Nayef and Abdullah bin Hassan bin Talea' Asiri, a key member of Al Qaeda in the Arabian Peninsula (AQAP). The latter indicated a willingness to turn himself in, but only in person to Prince Mohammed, who sent a plane to Yemen to get him. He then blew himself up in the surrender, injuring Prince Mohammed, whose bandaged hand can be seen in a televised meeting that same night with King Abdullah (RIP). That evening's events have lots of significance. It was only realized later that it was the first use of the AQAP underwear bomb (the bomber passed through multiple security checks before meeting the Prince). It also cemented the legitimacy of Prince Mohammed in terms of his personal commitment and risk-taking to get AQAP members to turn themselves in -- confirming his upward track culminating in him being elevated to Crown Prince. Until he was shifted out a few weeks ago, suspiciously soon after Donald Trump's visit to Saudi Arabia. Let's just say that it's a somewhat less experienced crowd in charge in the USA and Saudi Arabia these days, headed into a very hot summer. At next week's G20 summit in Hamburg, Saudi King Salman and his delegation are staying as the sole occupants of the Hotel Fairmont Vier Jahreszeiten, and among many other specifications, King Salman is flying in his own throne for the visit.